SAN JOSE, Calif., (June 15, 2015) – Leading interactive entertainment company BANDAI NAMCO Entertainment America Inc. today proudly announced DARK SOULS™ III for an early 2016 release date for Xbox One, PlayStation®4 computer entertainment system, and Windows PC. A dark and brooding fantasy adventure awaits players in a vast twisted world full of fearsome beasts, devious traps and hidden secrets. Developed by acclaimed Japanese developer FromSoftware, DARK SOULS III is the latest chapter in the critically acclaimed DARK SOULS series with its trademark sword and sorcery combat and rewarding action RPG gameplay. Players will travel across a wide variety of locations in an interconnected world of unrelenting challenge and deep RPG gameplay as they search for a way to survive the coming apocalypse. DARK SOULS III will arrive on Xbox One, PlayStation®4 system and Windows PC early 2016. DARK SOULS III will be shown behind closed doors at BANDAI NAMCO Entertainment America Inc.’s booth at E3 2015 located on the mezzanine level of the South Hall in rooms 303A&B. 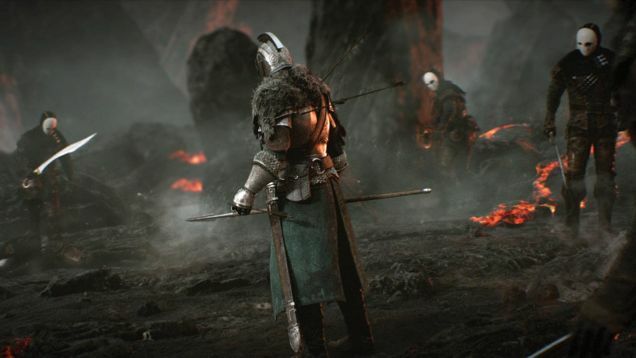 For more information on DARK SOULS III and the rest of BANDAI NAMCO Entertainment America Inc.’s line-up please visit: http://www.darksouls3.com, http://www.bandainamcoent.com and or follow us and join the conversation on Facebook at: http://www.bandainamcoent.com.